Description: NYSW #4008, NYSW #4006, NYSW #4004, NYSW #4002?, all B40-8's, looks to be sitting fresh out of the GE shops up in Erie, Pa. The date is approximate. Description: Four brand new (arrived in Binghamton 3 days earlier) NYSW B40s team up with a Guilford painted GP39-2 to move UB-20 north under a stormy sky. 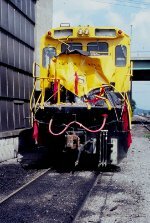 Description: Note light jointed rail. Description: Thanks to "Railpace" Magazine, we could easily chase the train using their maps. No GPS in those days! Description: It was a hot, dry summer. Description: Note sign below crossbuck- "Notice- trains are now using this crossing"
Description: Extra 4006 MP 124.4 Location Unknown,New York State I think. Description: NYSW 4006 was leading an excursion during the recent NRHS convention in Jersey when it hit a dump truck at a crossing on the ex L&HR. It made for a memorable trip, though for the wrong reasons. They moved the unit to Binghamton, and eventually back to GE for repairs. Here it is sitting outside the Binghamton shop. Description: The nose of NYSW 4006, recently banged up in a crossing altercation in Jersey, puts on a good face at Binghamton. Description: I believe this is the fateful NRHS excursion where up in Vernon the train had an encounter with a large dump truck. Photo by my father Jim. Date is approximate. Description: NYSW 4006 is back in service after an unfortunate encounter with a dump truck during the NRHS convention a couple of months earlier. It was sent back to GE for rebuild. Now its rolling RPPY into the yard. Description: Six units lead todays SLN 3, five of them Yellowjackets. Description: Just east of MP 233 there is a short stand of trees on either side of the tracks. The anticipation builds as you hear the train approaching, then burst from the shade. Tele view from Miller Beach Rd of MEBU. Description: A view of MEBU coming though Waverly shows the lay of town. On the right is CR customer Leprino Foods. On the left is the row of buildings down town, just beyond the Fulton St crossing. The train is about to pass Ted Clark's Busy Market, a Waverly landmark, just out of the photo to the left. Description: The time between when the corn went brown til the first snow could have some wonderful light, especially late in the day, when it made all the corn and grasses take on this golden hue. MEBU rolls west between Chemung and Wellsburg past one of those cornfields. Scenes like this made it a joy to chase in the Southern Tier, despite the lack of density compared to the Chicago Line or the ex PRR. Description: A little past harvest time, actually. SLN 5 rolls past a field of stubble corn in Owego on its way to Buffalo. Description: A coal train for the Mt Tom power plant in Massachusetts rolls up to Bevier St to get its pushers for the trip up Belden Hill. Description: SLN4 behind a motley mix of power roll east along US 11 past Willow Run Foods as it heads for Starrucca Viaduct and New Jersey. Description: SLN 4 rolls high above the small borough of Lanesboro, as trains have done for 140 years. 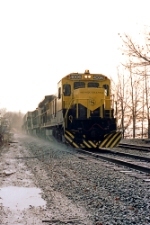 Description: Sometimes if there was a conflicting move on the Erie side, the Hornell dispatcher would run a train in or out of East Binghamton on the DLW side, known here since EL days as track 3. MEBU is getting the DLW side this morning as it heads west. It will go past the Lackawanna station downtown as it heads for West BD and the Erie main there. It's a Saturday morning, and the faithful are on hand to see the action. Description: A mix of power starts up the hill with PYRP at Bevier St. 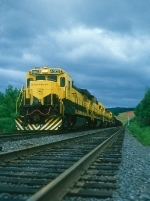 Description: A bunch of NS/N&W C30-7's also spent some time on the D&H during the 1988-1989 period.